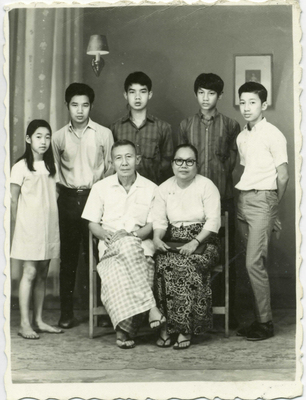 "Lulu, Tun Shein, and Family "
An undated photograph of Lulu, Tun Shein, and their children. It was possibly taken by Henrietta Thompson when she visited the family in Burma (now Myanmar) in June, 1972. Lulu began her training as a nurse around 1837, when she was about fifteen years old. She and a number of fellow nurses and Tun Shein, who later became her husband, worked for Gordon Seagrave’s mobile surgical unit in 1942, and participated in the Walkout in May of that year.